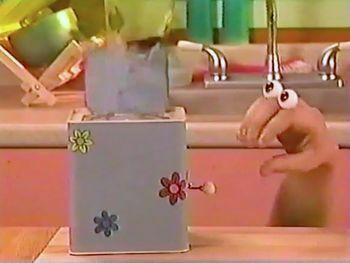 Oobi was a puppet TV series that was co-produced by Sesame Workshop and Nickelodeon for Noggin. The show began as a series of shorts that aired during commercial breaks on Noggin starting from 2000. The success of the shorts led to full episodes being produced. 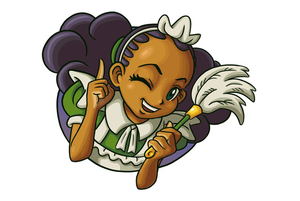 The full episodes aired from 2003 until 2005. In 2007, however, Nickelodeon pulled the plug on their partnership with Sesame Workshop. While the full episodes continued to air in reruns on Noggin, the shorts did not. The show is set in a neighborhood populated by bare-hand puppets, and is shown from the perspective of a 4-year-old boy named Oobi. The puppets tend to interact with the audience and encourage them to join in on whatever they are doing. The puppets speak in clipped sentences (ex. "Uma, school, first day!" instead of "It's my first day of school!"). Oobi lives in an old-fashioned single-story home with his excitable little sister, Uma, and somewhat hapless grandfather, Grampu. Oobi's best friend, Kako, lives right across the street and visits often. 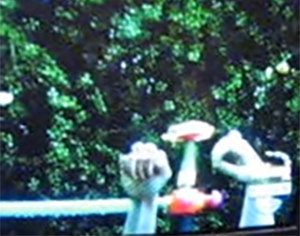 Each episode focuses on Oobi discovering or learning more about a particular concept, such as a game or sport. 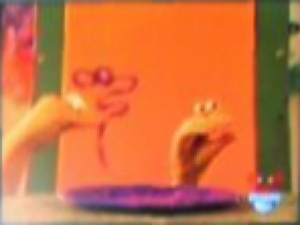 Uma and Kako provide comic relief, often misunderstanding Oobi's discoveries in a comical way. While all of the full episodes are available to legally watch for free on YouTube, 15 of the 48 known shorts are completely lost. 1 "Dance!" Partially Lost Available on the Blue's Clues: Shapes and Colors! and the Dora the Explorer: Rhymes and Riddles DVDs, albeit lacking the ending. 6 "Watermelon!" Partially Found Last 10 seconds. 7 "Soup!" Partially Found A short clip of this episode is featured in the shorts' opening sequence. 13 "Worm!" Partially Found A short clip of this episode is featured in the shorts' opening sequence. 18 "Water Games!" Partially Found A low-quality screenshot of this episode exists online. 19 "Guess!" Partially Found A screenshot of this episode exists online. 23 "Animal Cookies!" Partially Found A short clip of this episode is featured in the shorts' opening sequence. 24 "Slide!" Partially Found A short clip of this episode is featured in a promo. 27 "Dig!" Partially Found A Behind-The-Scenes photograph of the production of this short is featured on Tim Lagasse's website. 28 "Hide and Seek!" Partially Found A short clip of this episode is featured in the shorts' opening sequence. 29 "Nature!" Partially Found A short clip of this episode is featured in a promo. 32 "Guitar!" Partially Found A short clip of this episode is featured in a promo. 36 "Painting!" Partially Found A low-quality screenshot of this episode exists online. 39 "Pinch Pot!" Partially Found A short clip of this episode is featured in the shorts' opening sequence. 46 "Bubble Bath!" Found Available on the Dora the Explorer: City of Lost Toys and the Blue's Clues: Blue Takes You to School DVDs, albeit lacking the beginning. A low-quality screenshot of "Water Games!". A low-quality screenshot of "Painting!". A photograph of the production of "Dig!". Oobi Wiki article on the show's list of episodes.